Airports operator BAA has said that passenger numbers did not grow as much as expected last month because of the cold weather. Passenger numbers across its six UK airports were up 1% from a year ago to 7.9 million, but BAA said the rise would have been 2.7% without the snow. Snow disruption hit Edinburgh airport, with passenger numbers down by 3.9%. 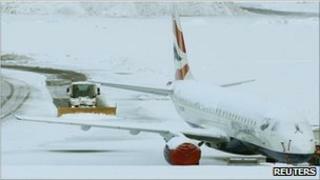 BAA chief executive Colin Matthews said it was "a tough month for passengers" with "the worst snow for decades". However, international passenger numbers were unaffected by the weather and the number of passengers using Heathrow, the main international airport, hit 5.24 million, a rise of 4.3% over November 2009 and the fifth consecutive monthly record. At Stansted, numbers fell 7.6%, but BAA said this was largely due to a fall in low-cost airline capacity. The biggest growth in demand was for travel to China (up 9.7%) and India (up 5.3%), two of the fastest-growing economies in the world.